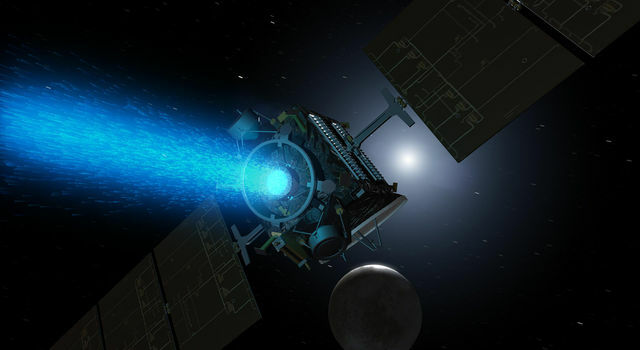 Dawn's journey ever-deeper into the asteroid belt continues to go well, as the spacecraft carries out its familiar routine of thrusting gently with its ion propulsion system. But the interplanetary traveler has changed some of its habits, performing certain activities a little differently now from what its many followers have been accustomed to. Dawn is now so far from the sun, that even with its tremendous solar arrays, the most powerful ever used on an interplanetary mission, it does not receive enough sunlight to generate sufficient electrical power to operate all systems and still achieve maximum thrust. The largest consumer of power onboard the ship, the ion propulsion system is power hungry. Indeed, the key to its remarkable effectiveness is that, in concert with the solar arrays, it converts the renewable energy from the omnipresent sunlight into thrust with a high velocity beam of xenon ions, in contrast to conventional propulsion systems, which only work with the more limited energy stored within the chemical propellants. The importance of high power to thrusting has been discussed in detail in several previous logs, including in July 2008 and September 2009. In preparation for the spacecraft's being as far from the sun as it is now, the mission control team has conducted a great deal of work (including the solar array calibration that was explained in the first of those two logs and performed in November 2008). Now we can see how some of the detailed planning has been put into effect in the operation of the ship. The electrical power generated by a solar cell depends on its temperature. When a cell is warmer, it is a little less efficient at transforming light into electricity, so it yields a little less power, even if the intensity of light impinging on it is unchanged. When Dawn is not thrusting, the onboard power demand is much lower, so less power is drawn from the two huge wings of cells. That means that less of the light captured by the solar arrays is converted to electrical power. So where does the energy of that light go? When the solar panels do not need to generate as much electricity, the excess energy of the absorbed light simply turns to heat, warming the wings. Therefore, the arrays are warmer when Dawn is not thrusting; and when thrusting commences, the arrays need to cool down before they can achieve their best performance. Earlier in the mission, when Dawn was closer to the sun and could produce far more power than it needed (even when the arrays were warm), this small difference was entirely unimportant. Now it is very important. Each week (usually on a Monday), the probe stops thrusting for around eight hours so that instead of pointing an ion thruster in the direction needed to climb out to Vesta, it can aim the main antenna to Earth in order to exchange radio signals with an antenna in NASA's Deep Space Network. At the end of the communication session, the spacecraft returns to the thrust orientation and resumes its powered flight. For the last few months, the solar arrays have been able to meet the onboard demand when they were cool, but when they were warm, the available light was too weak to yield the power required by all systems. There were several solutions to this (some of which probably would have lent themselves to simpler and more jocose descriptions), and the one engineers chose was to initiate thrusting at a somewhat reduced throttle level, demanding less power than at full thrust. That drew enough power from the arrays to bring their temperatures down, allowing them to approach their highest efficiency. Then the sequence running in the main computer commanded the ion propulsion system to throttle up, and the arrays were able to provide the additional power. This strategy has been in use every week since April 19 and has worked flawlessly. As Dawn moved farther from the sun, the power diminished still more. The team knew well in advance that by May, even when the array temperatures were low, there would not be enough power for all systems while at the maximum throttle level. So, beginning May 17, when the spacecraft completes its weekly communication session with its main antenna, it powers off its radio transmitter. Prior to that date, the transmitter had always been left on, even when Dawn was not in contact with Earth. The radio signal had been directed through an auxiliary antenna that broadcasts over a very wide angle in exchange for making the signal much weaker at the receiving antenna on Earth. (This is no different from the control on a flashlight. A narrowly focused beam can easily illuminate a small area, just as Dawn's main antenna allows it to transmit a strong signal toward Earth. For the same power, a wide cone of light from the flashlight provides fainter illumination over a far broader area, but it does not require precise pointing; similarly, Dawn can spread out a weak signal without choosing an orientation specifically designed for communications.) With the transmitter off, Dawn reduced its power needs, thereby ensuring it had enough to allocate to ion thrusting. By July 26, that strategy was no longer sufficient to accommodate the ever-decreasing power. Since then the ion propulsion system has been throttled down during the mid-week health check. Reducing power for the ion thrust allows power to be devoted to the transmitter. Based on extensive analyses performed in 2009, engineers had estimated that Dawn would no longer be able to sustain the highest throttle level by the last week of July 2010, even with the radio off. As it turned out, however, the craft exceeded their expectations and persisted through August 23. Finally, at a distance of 2.02 AU from the sun, it was time to reduce the power to the ion drive. From now on, Dawn will gradually decrease thrust as it travels still farther from the brilliant star. Even at lower throttle levels, however, the ion propulsion system's efficiency is far beyond what is achievable with chemical propulsion. In February we took a detailed look at Dawn's daily change in velocity and recognized that it would continue to increase (thanks to the decrease in the total mass) until throttled operation would be necessary. As predicted then, the space traveler has now reached its peak acceleration of 7.6 meters per second per day (17 miles per hour for a day of thrusting). As this had been accounted for long ago in the design of the trajectory, and motivated some of the tests performed shortly after launch, the future gradual reductions in thrust have already been incorporated into the plan for keeping the ship on a steady course to Vesta and then to Ceres. As the spacecraft continues its ambitious expedition through the asteroid belt, engineers have recently changed another aspect of its operation as well. On August 23, following instructions that had been stored in the main computer the previous week, Dawn powered off all four of its reaction wheels. (It's only coincidental that that is also both the date the ion drive was throttled down to save power and the date there was a power failure in the ice cream shop at the Tribute to Coincidence.) This was the first time since the day it was launched that all the wheels were off. For most of its mission so far, Dawn has used three of these units at a time to help hold its orientation or to turn to a different orientation in the zero-gravity, frictionless environment of spaceflight by electrically changing the speed at which they spin. Wheel no. 4 developed increased friction on June 17, so it was turned off, and wheels 1 - 3 have been in use since then. Mission controllers subsequently elected to turn all the wheels off in order to help preserve them for use at Vesta and Ceres. With the wheels being given a rest, the reaction control system takes over their function. This system fires conventional rocket propellant (perhaps even the same hydrazine formulation you use in your rocket) through small thrusters aimed in different directions to provide the required control of the craft's orientation. 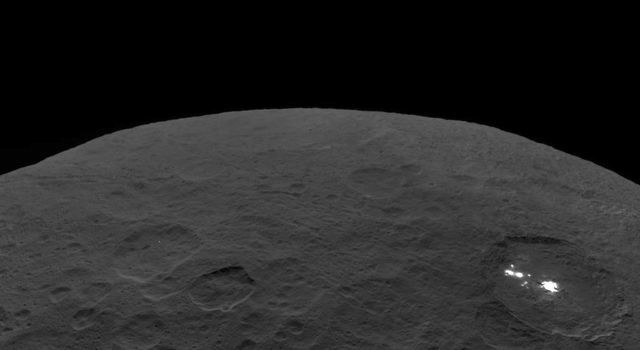 Since smoothly accomplishing the transition, Dawn has maintained its usual schedule of devoting 95% of the time to thrusting, gradually changing its orbit so that it will match Vesta's orbit in about 11 months. The occasional brief pulses from the hydrazine thrusters are very effective at keeping the spacecraft stable, but they are too weak to contribute much to reshaping the trajectory around the sun. Even if the entire 45.6-kilogram (101-pound) supply of hydrazine Dawn carried into space had been devoted to changing the probe's velocity, the effect would be less than 0.1 kilometers per second (220 miles per hour), quite insignificant compared to the 4.81 kilometers per second (10,800 miles per hour) the xenon ion thrusting has already achieved (and even that is less than half of what is planned for the entire mission). The ion propulsion system is so much more efficient that it remains the only system capable of propelling the ship to its distant ports, Vesta and then Ceres. 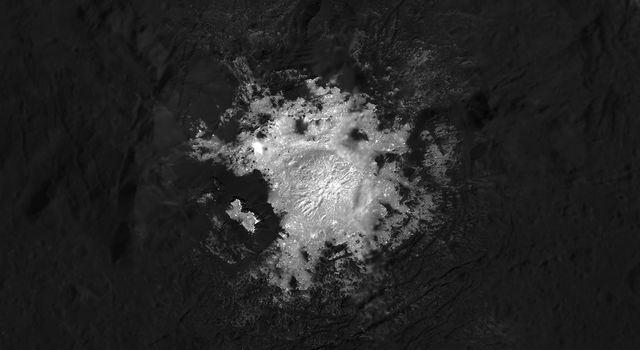 Dawn continues to make excellent progress in its voyage to those ancient and unexplored worlds. In the next log, we will consider how far it has come and look ahead to more of what is store for it at the first of these enticing targets. Dawn is 0.19 AU (29 million kilometers or 18 million miles) from Vesta, its next destination. It is also 2.82 AU (421 million kilometers or 262 million miles) from Earth, or 1070 times as far as the moon and 2.79 times as far as the sun. Radio signals, traveling at the universal limit of the speed of light, take 47 minutes to make the round trip.